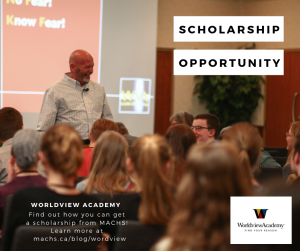 Win a Scholarship to Worldview Academy! Many of you will remember Bill Jack who has spoken at our MACHS conference. Bill is a faculty member with the World View Academy. Also a number of homeschooled Manitoba teens have participated in these camps in the past with very positive experiences. At Worldview Academy Leadership Camps, junior high and high school students, ages 13 and up, are challenged to think hard about their faith. They are treated like real people who wrestle with real issues—and who need answers that match the real world. Each camp features 20+ hours of lively classroom sessions and discussions, which guide students to better understand servant leadership, apologetics/evangelism, and comparative worldviews. The Worldview Academy experience is unlike any other. Students are taught by inspired teachers, challenged by creative activities, moved by meaningful worship, and welcomed into a community of life-long friends. Students join groups of the same age and gender for the discussion of the big ideas. They are led by college-aged small group leaders from across North America who have dynamic personal relationships with Jesus Christ and the life skills and spiritual maturity to lead students in discussions throughout the week. The six days are filled with laughter, tough questions, biblical answers, and a deepening hunger for Christ. If you would be interested in attending a World View Academy Camp and applying for this scholarship opportunity, the MACHS board would ask for the teen to write a letter of application (1000 words maximum length). Identifying who you are, some information about you (age, interests, and family), tell us about your homeschool journey so far, and explaining why you would like to attend camp. We would ask that these be sent to [email protected] by April 22, 2019. Many of you received an email from Manitoba Education and Training regarding the provincial K-12 Education review that will begin soon. MACHS will be working with other organizations in encouraging a consistent response from the home school community. A clear and united voice of homeschool families will help in positively influencing the review recommendations. We are awaiting details on how the process of providing input will work, such as where in person meetings will be held to hear submissions. MACHS will be sending you, in the coming days, a briefing document. This will provide your family with sample emails and notes to help you in sending written input along with preparing to speak at in person meetings. We would ask you to be in prayer as we prepare to make our voice heard as Christian home educating families across Manitoba.